Let me set the imaginary scene for you: A bunch of executives are sitting around a boardroom table at Nautique’s corporate office in Orlando. 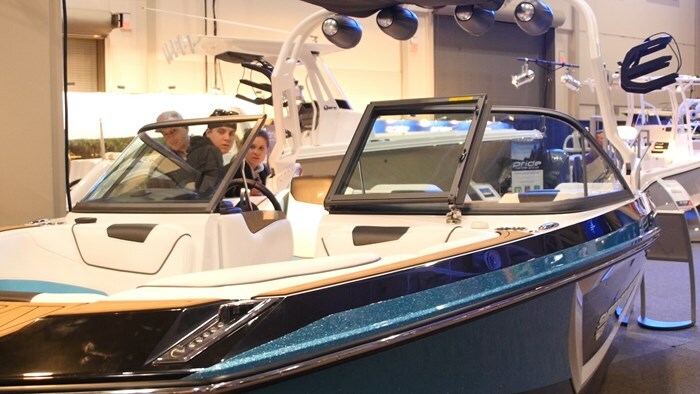 In walks CEO Bill Yeargin and he starts by saying, “Alright everyone, for our next line of boats, I want something that can do it all.” “I want it to be able to wakeboard phenomenally and throw an incredible surf wave..” He continues. “But sir, our boats already do that -” chimes in an unnamed executive. “You didn’t let me finish. I also want it to be a competition slalom boat.” He states, then sits down. Before the words can finish leaving his mouth there is a gasp in the room, followed by some cries of outrage. The mood in the room shifts from nervous tension to outward frustration. “It’s impossible!” cries one of the exec’s. “It’s never been done!” Proclaims another. I would like to imagine that’s what the scene was like at the meeting to first develop a true 20-foot crossover boat, but I’m sure it was really quite the opposite. Upon first glance, the GS20 looks like a baby G-series boat, and in reality, it kind of is. 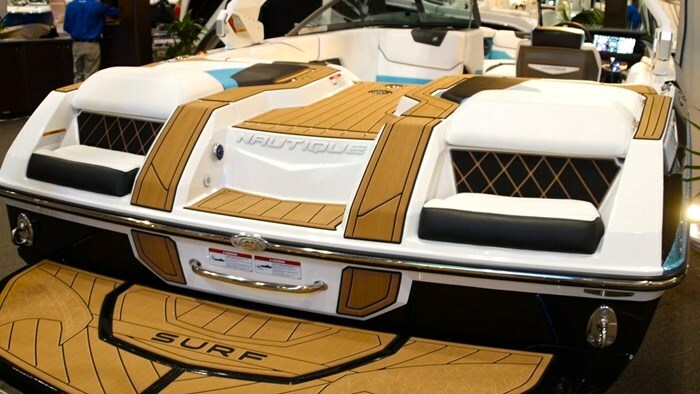 To create the new GS series, Nautique pulled from their award winning G-series but also looked to their world-record winning Ski Nautique hull. They combined the best of both worlds to give you something that everyone in the family is sure to love. The reality is, unless you’re a competitive wakeboarder, a high end tow boat isn’t always for you. You need something that is more of an SUV, something that can handle it all. A boat that you can progress your wakeboarding skills behind, slow down for a chill surf and still take the kids surfing. But then you should still be able to do course passes at 28’ off. With 1,850 pounds of integrated ballast and room for 12 people, this boat packs a lot into a small package. This will allow you to throw a banging wakeboard wake, along with a killer surf wave. 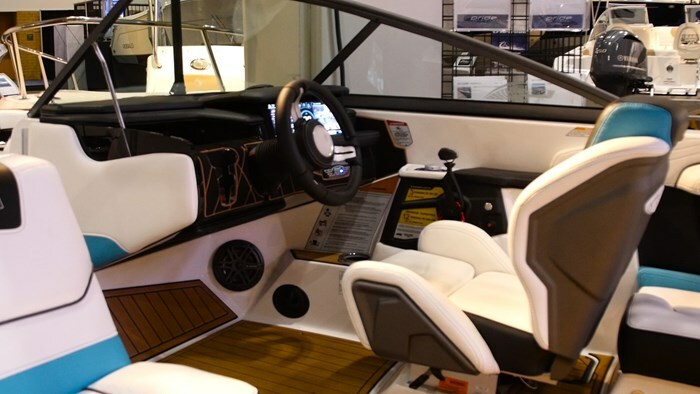 You can fine tune the wave with Nautique’s NSS system. Should you wish to transfer to the other side and surf your heel side, no problem. Just be ready to move as it will transfer in a matter of a second. I had a chance to surf the GS20 back in September and I was blown away by how well it surfed with just stock ballast, along with how fast the transfers were. You really have to be on your game and ready to move, but this will allow you to progress your surf game while getting better at turning buoys as well. 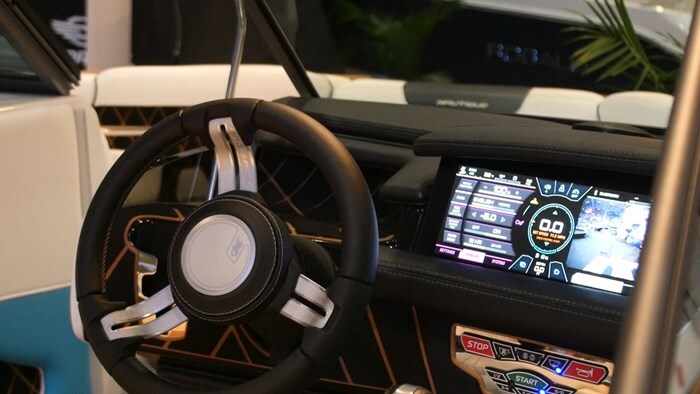 I’ve seen and used various touch screen systems in boats and this was clear and vibrant and the interface was intuitive and snappy. I was very impressed. It also clears away a lot of the clutter from your dash, giving you a modern, 21st century look, something you might see in a Tesla car. 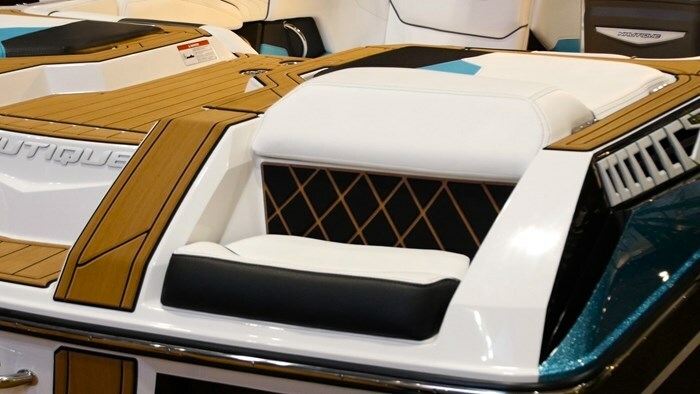 SeaDek in the pattern of teak is abundant throughout the boat, giving it elegant styling as well as comfort beneath the feet. Storage abound under most of the seats, along with deep storage in the barn door compartments that flank the engine. Board racks, biminis, folding tower and pumping stereo, it’s really hard to believe how much is packed into this boat. When I first got a chance to test the GS20 out, we were greeted with one of the windiest days I’ve seen on this lake we were on. In order to find some calm(ish) water to surf, we had to run head first into the chop, which would cause those in smaller inboards to cringe. Putting the throttle down we charged right into it, and the GS20 almost seemed to say “is that all you got?” It handled the chop quite well, while managing to leave our insides quite in tact. That would have been my only concern about his boat if I had only seen it on the carpet of the Toronto International Boat Show. But it passed that challenge with flying metal flake colours. 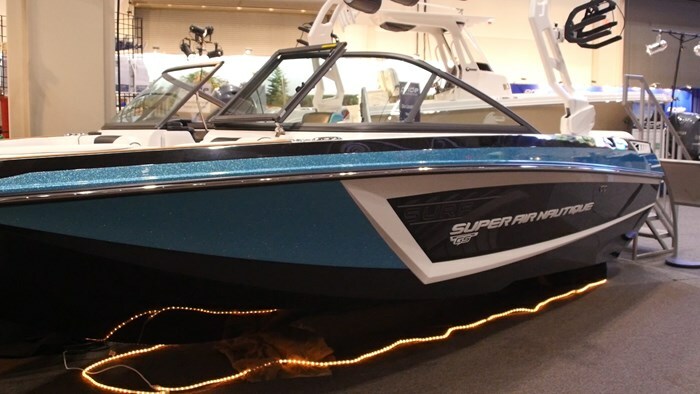 When you review a boat, you try to find something they might improve on moving forward, but I guess the negative comment of: “be less awesome” might be one that Nautique would gladly take.